Odani Castle (小谷城) is a mountain castle located in Nagahama, Shiga prefecture. 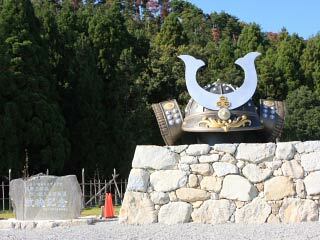 It is a castle of Azai Nagamasa, one of famous Sengoku Daimyo. Nagamasa was Oda Nobunaga's the brother in Law. However, he betrayed Nobunaga to show loyalty to Asakura clan, and died at this castle. Today, it has great ruins of the castle with great view of Lake Biwa. It is very hard hiking. 1. use JR Hokuriku Line to Kawage Station. 2. use bus or walk to Rekishishiryokan mae. Odani Castle is considered as one of five great mountain castles in Japan. It is located on the one of ridge of Mt. Odani. It was considered as one of the strongest castle during the Sengoku period. It is well know as the tragedy of Azai Nagamasa and his wife, Oichi. The structure of the castle is just like stairs. On the one of ridge of Mt. Odani, the gate, the residence of Samurai, the government office, the residence of Azai family, and Honmaru are placed from the bottom. In the middle of the ridge, there is a huge dry moat that divide the castle half. The upper half of the castle was used for retired houses for Nagamasa's father and guest houses. It was built around 1516 by Azai Sukemasa. Sukemasa was the grand father of Azai Nagamasa. Azai clan was flourished with the help of Asakura of Echizen. So, they were not Daimyo of Asakura, but their loyal duty of assigned to Asakura clan. However, Nagamasa married the younger sister of Oda Nobunaga. Nobunaga promised Nagamasa that he will not attack Asakura, but in 1570 Nobunaga breached his promise and invaded Echizen. Nagamasa had to betrayed Nobunaga and fought for Asakura. Nobunaga was defeated by the Union of Asakura and Azai, but he was so upset and attacked Odani castle right away. Asakura, this time, helped Nagamasa, but Oda and Tokugawa Union defeated Asakura and Azai at the battle of Anegawa. After the battle of Anegawa, Nobunaga surrounded Odani castle for 3 years, and in 1573, finally it was defeated by Toyotomi Hideyoshi. Nagamasa committed Seppuku at this castle. Then, Odani Castle was abandoned. Today, there are ruins of bailey, dirt hill and dry moats.